The touchscreen is certainly large enough to do on-screen editing. But if you want a view that's much larger than any sewing screen can offer, connect the machine to your PC via our exclusive Horizon Link. Now you can create and edit embroidery designs and stitch combinations on your computer with your mouse - anywhere, anytime. Layered Fabric Feeding System The Memory Craft 12000 comes standard with two AcuFeed Flex feet. The Dual Prong Foot gives you extra traction. The Single Prong Foot lets you get in close. Both are easily detachable. Use your PC to create original stitches from scratch. Or take existing stitches and alter them needle-drop by needle-drop. Your machine treats your custom creations just like built-in stitches; so you can edit, combine and save them to your machine or PC. It slips neatly, discretely onto the back of your machine to give you a bigger embroidery area than ever before, with even greater accuracy. So discreet and sleek, you can leave it attached for regular sewing. 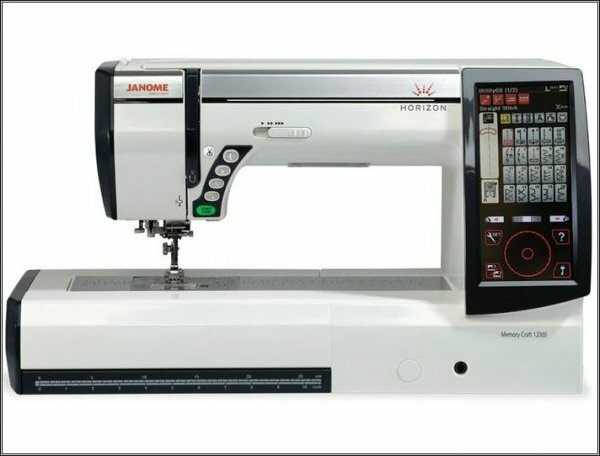 So cleverly engineered, it's the only machine to allow Free Arm embroidery: a Janome exclusive. Embroider or sew at up to 1000 spm with superior Janome stitch quality. 15" stainless steel plate in the sewing bed with embossed measurements. 11" to the right of the needle. 9mm decorative stitches, Variable Zigzag via the knee lifter, One-step needle plate conversion, 10 built-in LEDs in 5 locations. Adjustable AcuView Magnifier, 91 needle positions, Auto presser foot lift.